Do magnets work? Well, we receive a lot of fabulous feedback from owners and recently had our first video testimonial showing the results of magnetic therapy on Dawn’s horse Josh. Dawn contacted me through Facebook after purchasing a pair of Magnetic Ankle Boots, she couldn’t quite believe the results herself! 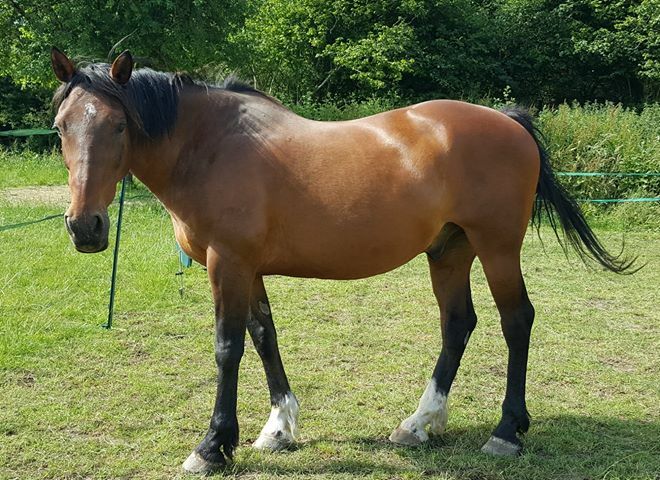 Her 21 year old thoroughbred horse Josh who she has enjoyed hacking since he was seven, had been suffering from arthritic stifle joints, one worse than the other due to a kick 13 years ago. Dawn noticed how Josh looked stiff and laboured when walking out on the hard ground this summer, but since using the Equine Magnetix® Ankle Boots over a couple of weeks she noticed a massive improvement in Josh and the videos below taken by Dawn speaks volumes! They’ve been placed side by side so you can see the difference ‘Before’ and ‘After’ wearing the magnetic boots. Josh now has a new lease of life, walking much more freely and wears his Magnetic Ankle Boots 24/7. “Really pleased so glad I bought them they’ve made a huge difference”. Thank you to Dawn for kindly letting me share the videos, the difference is amazing! Do you have an arthritic horse? If so, you may want to try a pair of magnetic ankle boots on your horse too? These boots can be worn above and below the fetlock joint and are ideal for turnout or stable use. They can be used for as little as 30 minutes to an hour before and after exercise and can be left on for longer periods of time. If you’d like to use them 24/7 then I recommend a short daily break from the treatment for an hour or so, so your horse can have a break from the treatment and you can check your horse’s legs. I also recommend removing the boots whilst you’re exercising your horse. Read more about the Magnetic Ankle Boots and find out how they could help your horse. This entry was posted in Arthritis, Stiffness. Bookmark the permalink. I bought the magnetic ankle boots for my TB gelding (Cash) as he was very very stiff. I was advised to get the ankle boots to at least try. I didn’t think they would work, i can now say I am converted. 1 week later & I can see a huge improvement in him. I honestly can’t believe the difference in walk & trot. I can see he’s much happier in himself too. I am very very impressed & will highly recommend others to use on there horses.